1. 8 oranges, peeled, diced medium. 2. 8 slices pineapple canned, diced medium. 3. 4 bananas, diced medium. 4. 1 cantaloupe, seeded, peeled, diced medium. 5. 1 pound(lb) grapes, cut in half, seeded. 6. 12 pear halves, canned, diced medium. 7. 12 peach halves, canned, diced medium. 8. 25 fresh strawberries, medium sized. 9. 1/4 cup lemon juice. 10. 1-quart fruit juice, drained from canned fruit. 11. 25 crisp leaves of iceberg lettuce. 1. Combine all the ingredients except the lettuce in a mixing container, toss gently and chill thoroughly. 2. Place a leaf of lettuce on cold salad plates. 3. 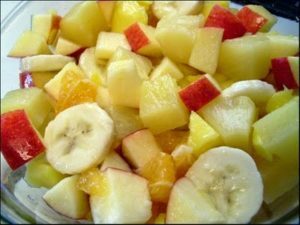 Portion out the fruit salad and place a mound on each salad plate. 4. Top with honey cream dressing, garnish with mint leaves. 1. 13 heads Belgian endive lettuce, washed, cut in half lengthwise. 2. 13 oranges, peeled, sliced into cartwheels,6 per orange. 3. 26 leaves, leaf lettuce. 4. 26 parsley or watercress sprigs. 1. Line each cold salad plate with a leaf of lettuce. 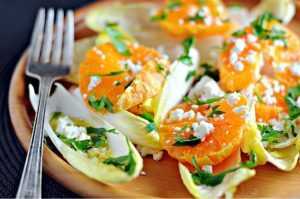 Place a half head of Belgian endive on the leaf lettuce base. 2. Line 3 cartwheels of orange on top of the endive, overlapping the cartwheels slightly. 3. Serve with bleu cheese dressing and garnish with a sprig of watercress or parsley.